Ducks Unlimited used a 2017 PLJV ConocoPhillips grant to help acquire a permanent conservation easement that protects 164 acres of North Platte River frontage in Nebraska. Completion of this project brings the total protected acres along the North Platte River in Scotts Bluff County to over 7,800 acres. In protecting this property, Wetlands America Trust (fee-title and conservation easement holding arm of Ducks Unlimited) now holds conservation easements on both sides of the North Platte River along this stretch. The North Platte River protection effort by Ducks Unlimited and it’s partners is an ongoing effort to perpetually protect critical habitat for millions of migratory birds and other wildlife that use the North Platte River. 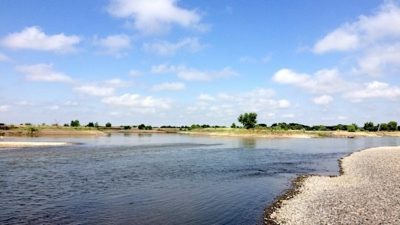 Peterson recently secured two small NAWCA grants that will protect two additional parcels along the North Platte River demonstrating the interest and determination to protect this valuable resource for future generations to enjoy.